Bharat Sanchar Nigam (BSNL) has introduced three new FTTH broadband plans exclusive for Chennai, Tamil Nadu offering higher download speed and increased FUP limit. 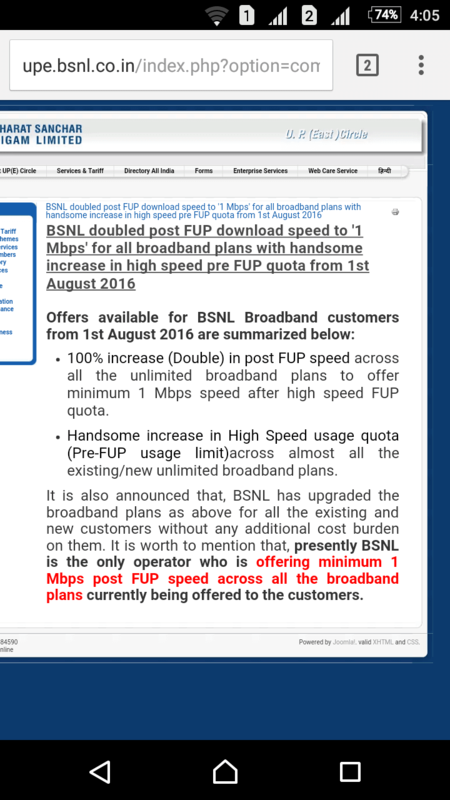 The new broadband plans will be available for period of 90 days as promotional offer with effect from August 05, 2016. Fibro Combo ULD 1299 broadband plan offer 30Mbps speed and comes with a FUP limit of 60GB. Similarly Fibro Combo ULD 1699 broadband plan offer 40Mbps speed and comes with a FUP limit of 80GB. While Fibro Combo ULD 2999 broadband plan offer 60Mbps speed and comes with a FUP limit of 250GB. The post FUP speed for all three plans are limited to 1Mbps. BSNL is also offering unlimited free calls between 9 PM to 7 AM to any network in India is available. Customer can also opt for Annual payment option by making advance payment for one, two and three years. The new Fibro FTTH broadband plan from BSNL is part of its strategy to introduce more SSA/Circle specific broadband plans to counter competition from local broadband players in the region. As with other circle/SSA specific plans, the above plan is only offered in those locations where there is a matching competition from private operators.